Guys, unless you are in bed with either Namisu or Bock, you are technically just speculating. For me... I am very dissapointed, but since is out my control, I only need to sit tight and wait. Good thing I have enough pens and inks to keep me entertained. I wouldn't say it's just speculating. Speculate means "form a theory or conjecture about a subject without firm evidence". We are speculating what could be wrong with Namisu but I think there are plenty of evidence showing that they are not being honest. There are evidence showing that nib is not the only problem contribute to the delay while in the update, they pretty much blamed only Bock. And from what they said themselves, it's pretty clear that they knew this problem far far before the actual shipping deadline and chose to keep it from backers. And it is a FACT that they are selling on their website and on Massdrop with almost immediate delivery and their explanation is these pens were made before. But they sold the pens on Kickstarter BEFORE any future purchase that will be made on Massdrop or their website. Their explanation makes no sense to me. What does it mean that these pens were made before? If you cannot fulfill the orders already placed, you don't take any other order. The only explanation is, they don't care about shipping the pens they sold on Kickstarter as soon as possible. They are definitely playing with the Kickstarter rules. I wouldn't say any of these are speculation because there are concrete evidence. And yes, I have enough pens but I was expecting a great pen maker whom I could buy more pens from in the future. If you look at the comments on Kickstarter, many people were expecting the pens as Christmas gifts. It's just sad. Edited by woleizihan, 30 November 2017 - 00:10. I am an early backer, disappointed with the many extensions of the shipping date. I don't know what to believe; I'm just disappointed, and I want my pen. I don't know what to believe; I'm just disappointed, and I want my pen. That about sums up my feelings about this purchase too. I think it's fair to say we're speculating on what the problems are behind the scene, but regardless of what those issues are, I think most people are disappointed by the way they're being handled, which is well outside the realm of speculation. I'm sure many comments, mine included, are influenced by frustration. After all, instead of immediately notifying their backers two weeks ago when they ran into problems, they waited until the day everyone expected to see their shipping notices, only to send delay notices instead. It's doubly disappointing! "We expect to ship the Ixion pens throughout 29 - 31 January. Given the large amount of product variants for this project (over 40 versions plus accessories), we need a bit more time to organise the shipment of the pens both physically in our shipping partner's warehouses in the UK and USA, and through our online system that assigns each order to its carrier, whether domestic or international." I too am disappointed particularly with the poor and inconsistent communication from Namisu and I do believe they are simply obfuscating to cover up bad planning and worse execution of this project, and as for shipping to ’partner’ warehouses that’s just more nonsense. Offloading blame onto Bock is only acceptable if it is evidenced; I would suggest that it is more likely that Namisu failed to place their orders in time with Bock and this was the source of the delay with Bock. It’s difficult to believe that what is essentially a small order that should have been programmed in with their manufacturer, with an allowance for more orders than originally envisaged, could cause this many problems especially as most manufacturers will assemble and pack for you and then bag it and hand it to your courier and as long as you use a decent company such as DPD/FedEx or UPS (and not Hermes) you should be fine. Ultimately we paid our money with the expectation that the company would keep its promise and they have failed to do so; I won’t back another of their projects as I don’t enjoy being treated in such a shabby way. I apologize if this has been already addressed or else not a welcome comment, but how is this design not a very strong rip off Kaweco's designs? It's like a streamlined Kaweco Perkeo cap posted higher on a longer Kaweco Sport Al barrel in all-aluminum. Same type of inset circle of different material in the cap. Also Bock nib even. I essentially view it as an oversized Kaweco Sport and I think the reason is obvious. 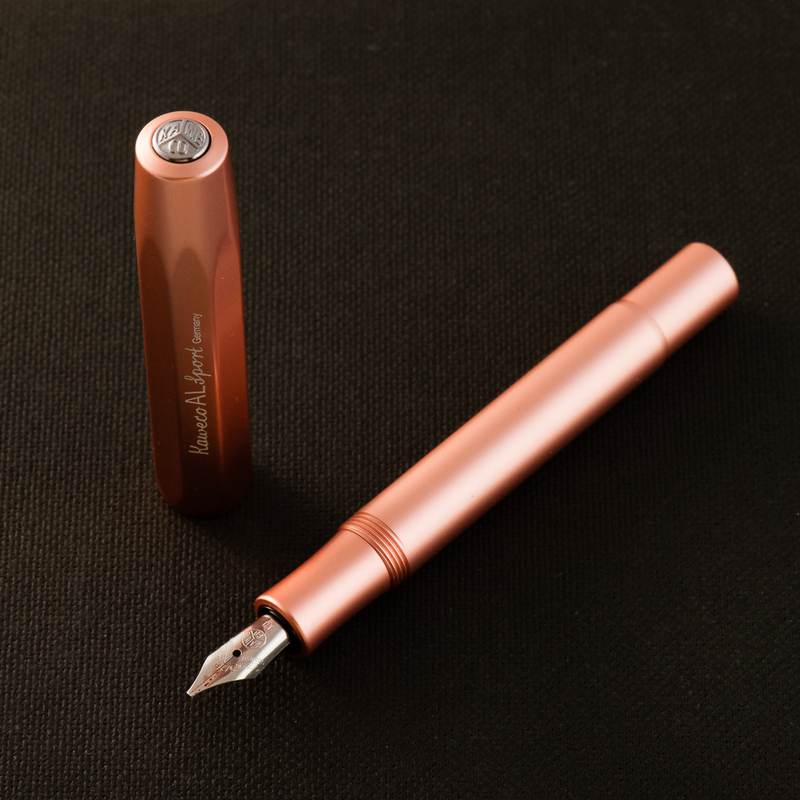 I ordered mine in brass precisely because it reminded of my Kaweco Brass Sport just a full sized version. That's exactly what I liked about it. I apologize if this has been already addressed or else not a welcome comment, but how is this design not a very strong rip off Kaweco's designs? It's like a streamlined Kaweco Perkeo cap posted higher on a longer Kaweco Sport Al barrel in all-aluminum. Yes.. is similar, and that is why I like it. A longer, great looking and much cheaper version of the Kaweco Al. Has anyone got their pen? The latest word was that they'd be shipping towards the *end* of January - so no, probably not. I know mine hasn't arrived yet! As mentioned by above, they said they expected to ship the al version Jan 29-31. Nothing is said for the brass and ti ones and it's already 29th now. I have 4 Namisu's. They're great pens. But if you're going to spend your money, try and find an ebonite Namisu Horizon - gorgeous pen. I think the plan was to ship everything together - their update simply gave the *numbers* of aluminium pens shipping (presumably because they were the cheapest and therefore the most popular), though I could be misreading this. Hopefully they'll all be shipping soon! As a 3-time backer of Namisu Kickstarter projects, let me say that this total mishandling of communication and updates is typical of them. They produce great products in the end (usually belatedly), but the 'radio silence' between updates is enormously frustrating for their backers, and is not very good for their reputation... You'd think they would have this all sorted by now, but their modus operandi never seems to change! I also hope so. I'll move in a month, which means further extension on shipping date will be disastrous for me. I don't understand why they just have that shipping address change form up for only three days. In my understanding, as long as the order is not shipped or shortly before that, people should be able to change shipping address and it won't take any extra effort from the seller or the shipping center. Edited by woleizihan, 30 January 2018 - 02:44. I got an email this evening saying my pens were dispatched today (UK Royal Mail). Mines a brass one so fingers crossed!